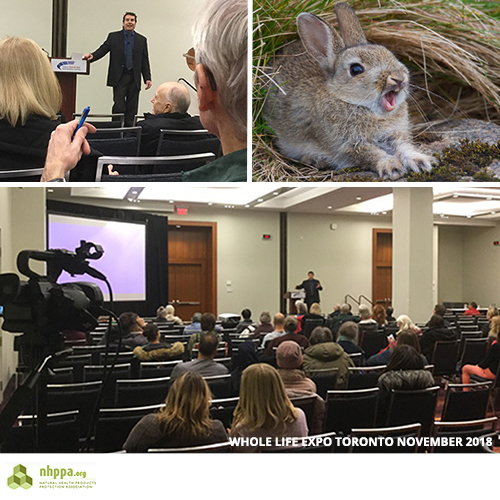 Shawn Buckley and NHPPA team members were at Whole Life Expo 2018 in Toronto on November 11, where Shawn gave his “Censorship, Science, Belief” talk. Manufacturers, retailers, practitioners and public attended the lecture. Many stayed afterwards to share personal and professional insights on how the new Health Canada regulations will, and have already, affected their access to natural health products and practices. We’ll post the recording of Shawn’s talk in the next few days! He’ll explain the bunny. In the meantime we’ve shared a few photos of the event with links to educational materials.